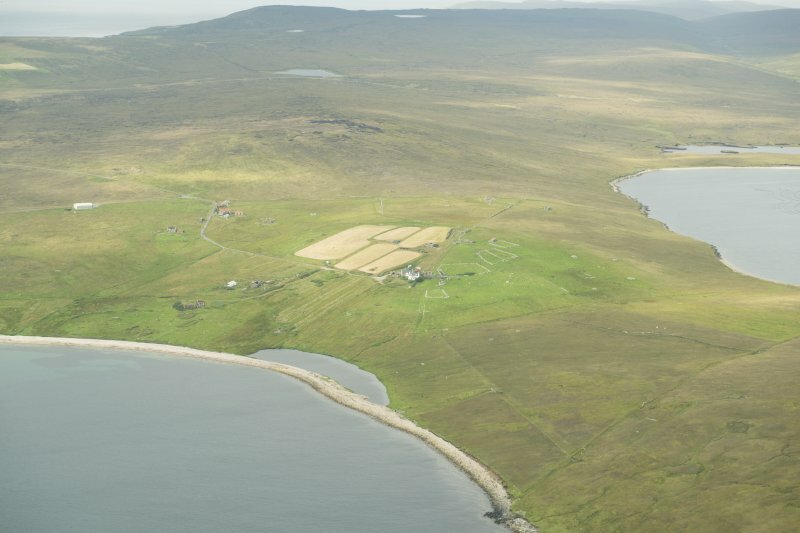 General oblique aerial view of Copister, looking SW.
Scanned ink drawing of cruciform stone at Copister, Yell. Present location: at the Old Haa, Burravoe, Yell. Evidence for discovery: found during ploughing to the north of Nettlehaa in the 1980s, close to the site of the old burial ground. Present condition: there is damage to one of the corners of the upper arm. This is a well-proportioned cruciform stone. Date: ninth to eleventh centuries. References: Scott & Ritchie 2009, no 84. HU 481 787 Medieval crucifix grave marker was ploughed up to the N of Nettlehaa in the 1980s; 55 x 37cm. The medieval church was situated at Copister; the house named Nettlehaa was built in 1821 to the SE of the burial yard. No visible evidence of church or yard now exists.